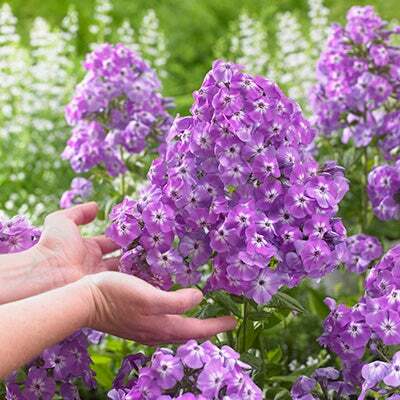 The easiest way to prevent powdery mildew on phlox is to plant disease-resistant varieties. If you already have phlox in your garden, or have your heart set on growing a classic variety, prevention is the best way to keep your plants healthy. At some point or another, many of us have experienced a gorgeous Garden Phlox inundated with powdery mildew. It can be heartbreaking! The best way to help prevent this is to plant disease-resistant varieties, which are less prone to certain strains of powdery mildew, and to take preventative measures in your garden for existing plants. If you’re struggling with powdery mildew on your plants, here are some tips for prevention and natural treatment that is safe for kids, pets, and pollinators. The colorful, low-growing perennial groundcover Creeping Phlox does not have issues with powdery mildew or other fungal diseases. In general, the best method of controlling powdery mildew is prevention. Once the disease shows up there isn’t a whole lot you can do to “cure” it, so putting in a little extra work ahead of time will give you a much better chance of keeping your plants disease-free throughout the season. Garden Phlox and Bee Balm (with the shorter, red blooms) are two perennials prone to powdery mildew. Many gorgeous and vibrant Phlox plants have been bred to resist the fungal strains that form mildew. Indigo-to-violet blooming 'Blue Flame' Phlox, cheerful 'Forever Pink' Phlox, fragrant purple 'Goliath' and pure white 'David' Phlox, are great examples of naturally disease resistant varieties that are less prone to certain strains of powdery mildew. That said, if you're planting Phlox in an area prone to lots of moisture (like the hot and humid southeast), you'll want to take preventative measures to prevent the spread of fungus, regardless of the plant's claims of immunity. Mildew-resistant 'Goliath' Phlox has beautiful purple blooms with white center eyes. 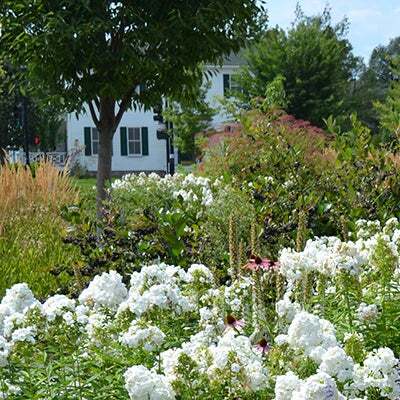 The mildew-resistant white blooms of 'David' Phlox look great planted en masse. Why Grow Non Disease-Resistant Phlox? Although disease-resistant Phlox may be the best choice for some, not all gardeners are looking to plant these varieties in the garden. Some may have fallen in love with a certain cultivar, especially if it holds sentimental nostalgia, like having been grown in grandma's flower garden. Others grow phlox in the cutting garden for flower arrangements, and may have grown attached to varieties that yield colors and flowerhead sizes that look great in the vase. Many have inherited their gardens and with them, phlox varieties that aren't disease resistant. A common story in many climates is that powdery mildew rarely forms, except for in heavy rainfall seasons or through long spells of heat and humidity. If controlling powdery mildew only becomes an issue every five years, there's not a ton of motivation to pull your plants and start all over. Regardless of your reasons for having non-resistant cultivars, there are plenty of easy ways to prevent powdery mildew from forming on your plants. One of the main reasons Phlox (and other perennials) get powdery mildew is due to poor air circulation; moving air stops the spread of fungus, as does exposure to sunlight. Poor air circulation is most often caused by plants multiplying, sending up close-together shoots and becoming overcrowded - which creates the perfect conditions for mildews to spread. The solution is easy: in the beginning of the season, as shoots start to emerge, use a pruner to eliminate about ⅓ of the shoots so that the remaining plants have plenty of room to breathe. This air circulation should help prevent disease from overtaking the plant. If your plants have had powdery mildew in past seasons, use a homemade preventative spray before the disease shows up. Spray weekly on the undersides of foliage, especially when you know there is going to be especially humid or damp weather. Powdery mildew is caused by a handful of different fungal strains. When shopping for a pre-made spray, look for a botanical 'fungicide'. Or, for a pet and kid-friendly solution, try the recipe below. Place this in a spray bottle and use when needed on the undersides of plants to prevent powdery mildew. Have white spots on the leaves and stems of the plants. Have a white dusting all over the plant that resembles flour. The leaves will turn yellow, dry out, and fall off. Once you’ve seen powdery mildew in your garden, chances are you’ll be able to spot it with certainty the next time around. It's important to use all natural remedies for powdery mildew to keep pollinators and other wildlife healthy. Remove all infected parts of the plant and destroy them. Do not compost them or toss them anywhere near your existing gardens. If you used pruners or other tools to cut the plant back, thoroughly wash them with a mixture of bleach and water (using ten parts water to one part bleach). Spray infected plants with an all natural, organic fungicide. This method can help alleviate some of the disease, but you may have to cut back the plant anyway if it doesn’t go away completely. Powdery mildew can be a gardener’s worst enemy, but it doesn’t have to be! Remember, the easiest way to prevent powdery mildew is to plant disease-resistant varieties and work on prevention in the garden. With a little work and smart planning, you (and the butterflies) will be able to enjoy your Phlox all summer long.